The restaurant is a special place for relax and recreation. Its design and atmosphere must be unique. Planning, design, music, kitchen, service create an unforgettable atmosphere of comfort, harmony, convenience. Convenient furniture layout is very important for the restaurant. There are two basic techniques of furniture arrangement in the hall of the restaurant: geometrical with accurate placement of tables and free. with our Restaurant Floor Plans Software. Cafe and Restaurant Plans solution includes a large collection of predesigned vector objects of various tables (round, rectangle, corner, etc. ), chairs, benches, and other restaurant furniture. 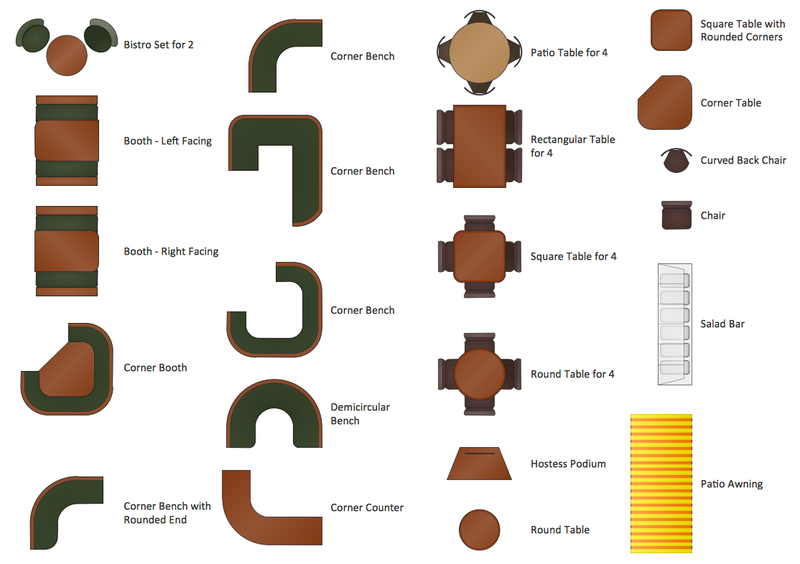 You can use these objects for simple and quick designing professional looking Restaurant Plans with any furniture layout. Cafe and Restaurant Plans solution also provides a set of samples and templates to help you create Restaurant Plans in a few minutes. This sample was created in ConceptDraw DIAGRAM using the Cafe and Restaurant Plans solution from the Building Plans Area of ConceptDraw Solution Park. It shows the Cafe Floor Plan, location of the main hall and the kitchen in the cafe, the furniture arrangement. 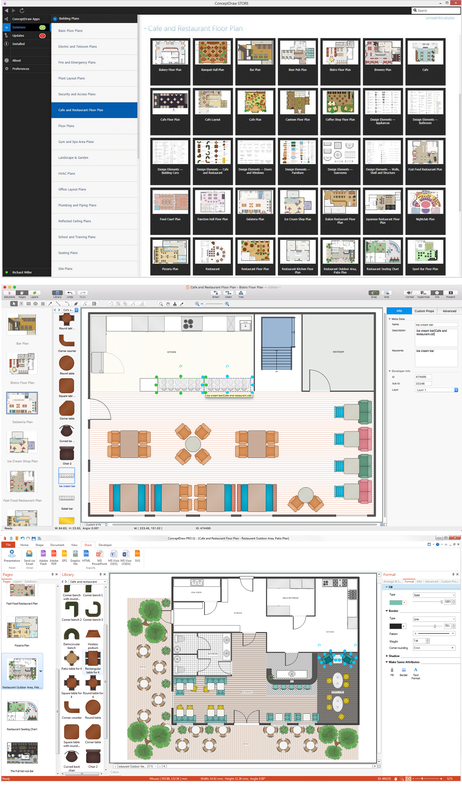 Use Cafe and Restaurant Plans solution for ConceptDraw DIAGRAM to create your own Cafe and Restaurant Floor Plans, Restaurant layouts and designs quick, easy and effective. 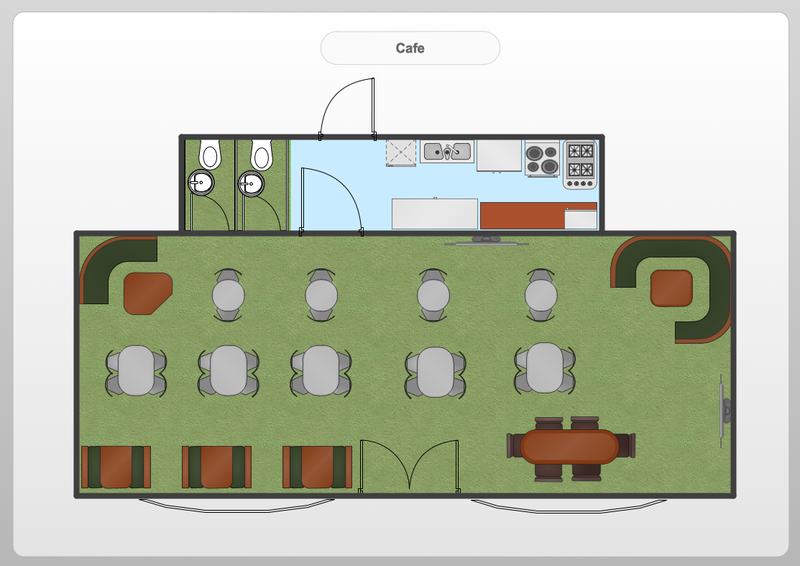 The Cafe and Restaurant Plans designed with ConceptDraw DIAGRAM are vector graphic documents and are available for reviewing, modifying, converting to a variety of formats (image, HTML, PDF file, MS PowerPoint Presentation, Adobe Flash or MS Visio), printing and send via e-mail in one moment. Cafes and restaurants are the places for relax and recreation, so the most important is their design and atmosphere of comfort, harmony, and uniqueness. So Cafe Design requires great creativity and efforts from the designers. 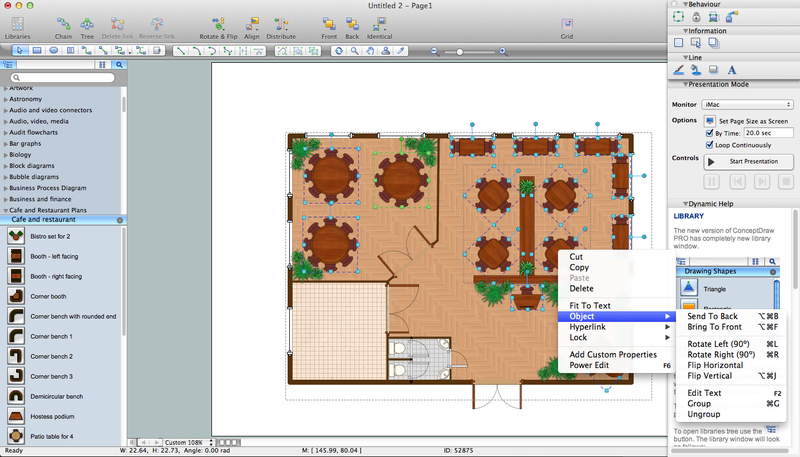 ConceptDraw DIAGRAM v12 software extended with Cafe and Restaurant Floor Plan solution from the Building Plans area of ConceptDraw Solution Park is the most simple way of displaying your Cafe Design ideas and plans first on the computer screen, and then on the paper. While studying, many of the students encounter the necessity of remaking class projects, over and over. To facilitate this process you can use special electrical and telecom plan software, which helps altering projects in several clicks. Using templates will fasten your work, and you will have more free time. This sample represents an electrical and telecommunication floor plan. Electrical and telecom floor plans contain a floor plan , on which imposed the layout of electrical, and telecommunications equipment. They shows electrical and telecom details regarding the current floor of a building: lightening, fixtures, wires, outlets, circuit panels, etc. Using of standart notation of electrical and telecommunication symbols makes the plan understandable for engineers, architects, constructors, specialist in electricity and telecommunications.